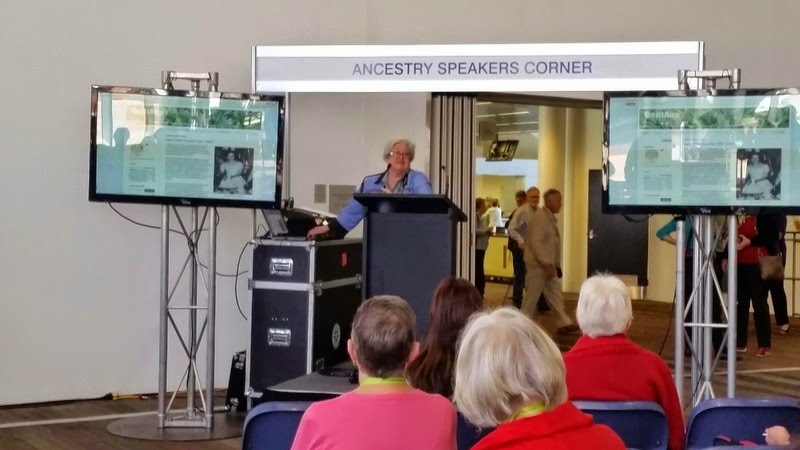 Thanks to my genimate, Michelle Nichols, for taking these photos of my gig on geneablogging in the Ancestry Speakers' corner at AFFHO Congress yesterday. Thanks also to Ben Mercer from Ancestry for inviting me to speak. A large contingent of the thirty+ Australian Geneabloggers who were at #AFFHO Congress gathered for a Group photo today. Thanks to Mr GeniAus who had quite a job getting us all to pay attention and smile for the birdie. Will I manage three more days? It was a huge day at #AFFHO Congress today so I wasn't too upset when one of the people I had planned to have dinner with suggested we shelve our plans. I was rather exhausted after a big day of learning and socialising so was pleased to share a nice dinner for two with Mr GeniAus who I have bee ignoring all day (and will be for the next three). It's 9:00pm and I still need to modify a presentation for Speakers' Corner tomorrow morning. As is my custom at these events my blog posts consist of lots of photos and little text because I just don't have time or the energy to write long essays. I retired my camera after David's session. The last talk I attended was a humorous "Dead Horse" talk by Colleen Fitzpatrick. While it was a great talk I was kicking myself as I realise I had heard Colleen present this same talk at another time and I should have read the description more closely and chosen something else. I must commend Kerry Farmer's excellent talk on DNA. I was the third time I have heard Kerrie present on this topic and I could listen again and again. Kerrie is a profession, polished and knowledgeable speaker. Because I am an inquisitive old bird I went to The Menzies Theatre to observe the Annual General Meeting of #AFFHO. There were no surprises there. 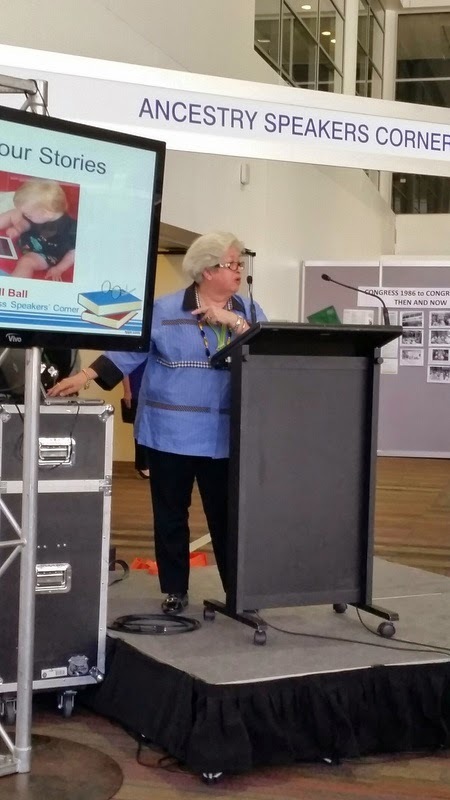 I do, however, want to congratulate retiring #AFFHO President and Conference Convenor, Kerrie Gray on a very successful term. She has done a superb job. I have found most of the geneabloggers who are at #AFFHO Congress and they have been ceremoniously beaded. I still need to find a few more bods to bead up. I will definitely have more beads at Speakers' Corner tomorrow at morning tea time as I will be there doing a presentation on "Blog your Family Stories" at that time. 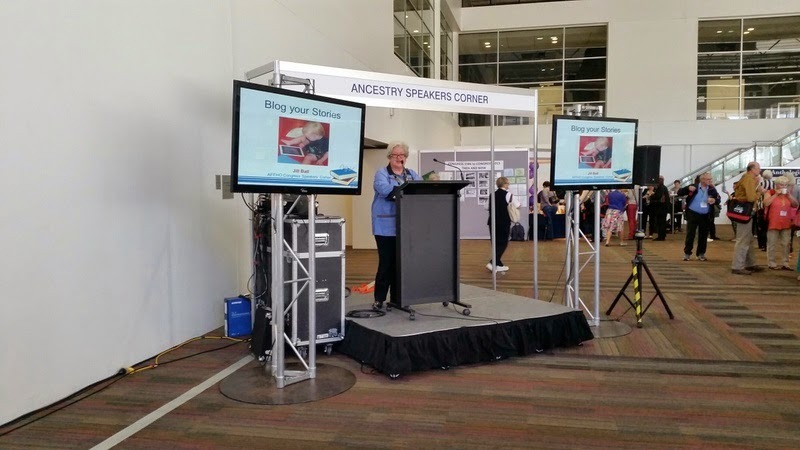 Thanks to Ben Mercer and Ancestry.com.au for inviting me to share my passion for blogging in the corner. It would be fun if some bloggers could join me there as I need some victims fellow bloggers to highlight. It is a tradition that geneabloggers gather for a group photo at geneaevents so I conferred with my mate Alona and have set the time of 12:35 for our photoshoot tomorrow, Saturday. Please gather near the Gould/Unlock the Past stand in the Exhibition prior to grabbing your food so that we can have a record of our gathering and PLEASE wear your beads. I have organised Mr GeniAus to come along and be our honorry photographer. 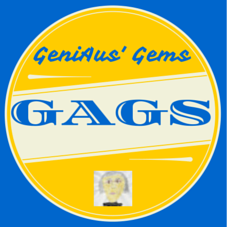 As I am in Canberra for the The 14th Australasian Congress on Genealogy and Heraldry 26-30 March 2015 I am getting my GAGs organised early so my cutoff day is earlier than usual. 7. Sharon asks an important question. 9. Sue gives some suggestions for getting organised. 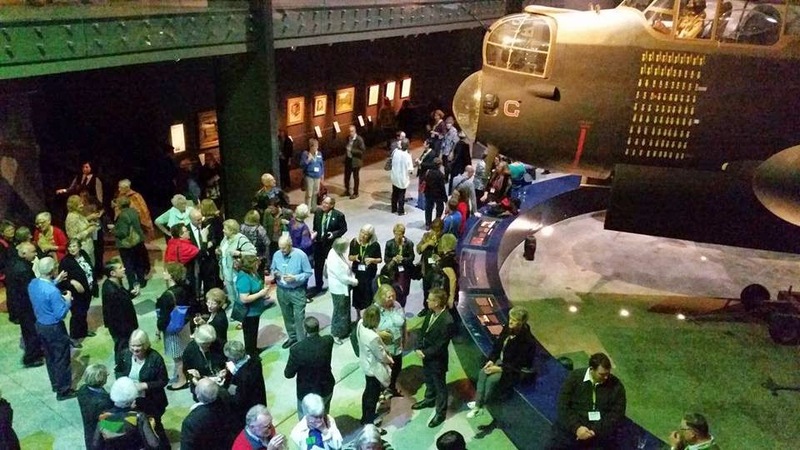 If the smiles on the faces of thesefolk at the Opening Reception for The 14th Australasian Congress on Genealogy and Heraldry at The Austalian War Memorial are indicative of their level of enjoyment then the event was a hge success. For my part I had a super time meeting up with old friends and making the acquaintance of several new folk from the UK, Us and several Australian States. The happy snaps iclude sponsors, delegates, keynotes and presenters. And thanks to my mate Michelle Nichols for taking this birdseye view. Someone said to me this afternoon "I bet you were here when registration opened". 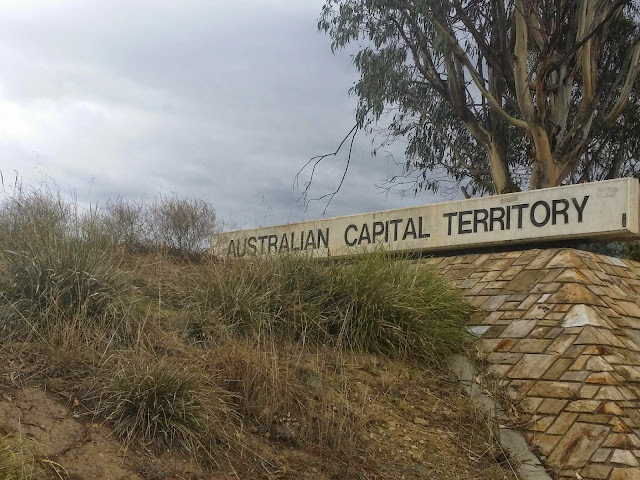 Well I am keen but I didn't arrive at The National Convention Centre in Canberra until ten minutes after registration opened but I stayed for nearly tow hours! What a buzz it was to meet so many old and new friends. I had my camera with me so I managed to take a few photos, thanks to my mates who got behind the lens to inclue me in a couple of snaps. I managed to give out about a dozen sets of blogger beads and added another geneablogger to my list. Congratulations to the team on The Registration for providing such a painless and smooth rego process. There were smiles all round. Helen's plane got her here safe and sound. 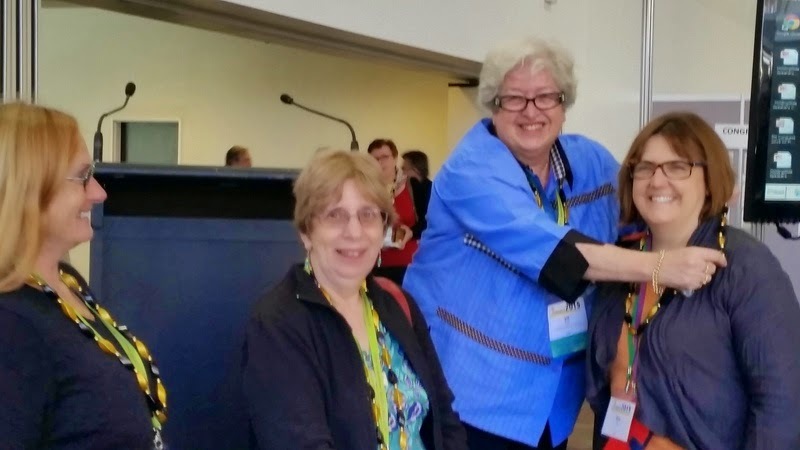 Although we are in regular contact on various social media channels your Official #AFFHO Congress Bloggers rarely meet in person as we live in three distant corners of Australia. So when we meet up "in the flesh" there is lots of excitement. If you are at Congress and you see one of us please say G'day .... and if you want to know about geneablogging ask one of the 30 bead wearing bloggers at Congress all about it. 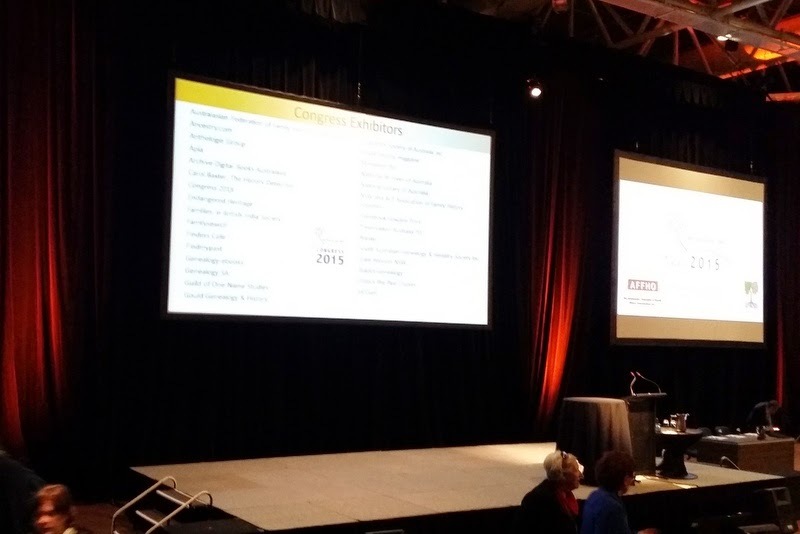 And don't forget to keep visiting the Compilations of Blog Posts from Congress at http://geniaus.blogspot.com.au/2015/03/geneabloggers-at-congress-posts-from.html where you'll find link sto as many blog posts as I can find from Congress 2015. Just thinking of a title for ths post and a time to start the compilation has given me something to think about. Do posts about registration go in the Pre-Congress Compilation or in this list of posts that are contemperaneous with Congress? I've drawn a line in the sand and decided that registering is part of Congress so I'll be adding any posts on that topic right here. So please keep coming back over the next five days to see what's doing in Canberra. And PLEASE let me know if I miss any posts. GeniAus' Pre-Congress prep is in full swing here, but I seem to have so much to do. All my mates on social media seem to be so organised while I am still trying to get my act together. I spent today at the National Library, I didn't dig up any dirt on the ancestors but I managed to get through 18 publications that told me a lot about the history of the towns in New South Wales from whence they came. I was also able to add a little to my knowledge about my 3x great uncle Rev Michael Harrington Ryan. It was fun to have a lunch break with my friends Pauleen and Sharn and to meet a fellow UTP cruiser and a genie from Tasmania in the Library. I have been in contact with the panelists for Monday's panel session and have submitted the powerpoint so that is under control (my nerves won't be). 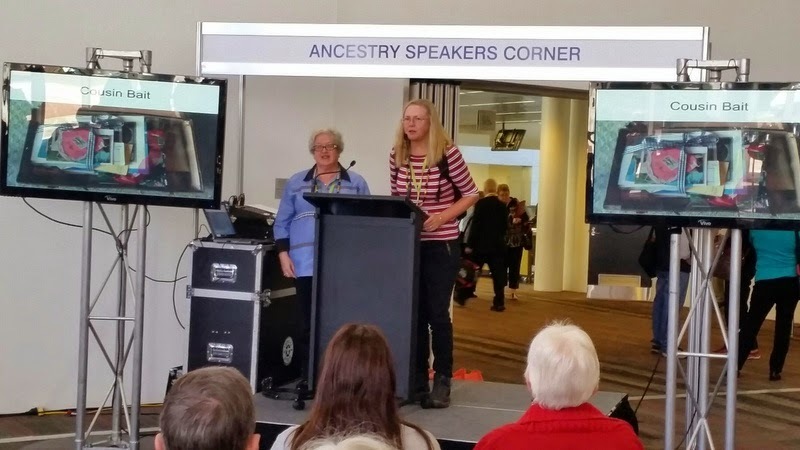 I have also been playing telephone tag with Ben from Ancestry all day as I may be doing a spot or two in the Speakers' Corner in the Exhibition Hall. I finally managed to tame the Congress app and have set up my program on the app. I also downloaded the list of delegates onto my smartphone so that I can tick off those I meet. I need to modify some of Carmel's Evernote templates that I downloaded so they are ready for my notetaking during the Congress sessions. I've added more entries to The Interests Database so that I have most of my ancestors' families covered. I also added an interest for the software package (Family HIstorian) that I use and an entry for my Curry in Australia Surname study. I don't hold out much hope for some of the things I've listed but I expect to be able to find some Curry connections. How I will ever keep up with social media, visit all the stands and take in all the talks I have listed, chat with delegates plus host a hangout I don't know but I'll give it my best shot. I predict that sleep deprivation is on the horizon but four days of fun and fulfilment will be my reward. Today I'm blogging from the car (Mr GeniAus is driving). Whenever I pass this sign I know that I'm not too far from Canberra. This time I'm super excited because it heralds the beginning of my #AFFHO Congress activities. I can't wait to catch up with my genimates, put faces to online pals and meet new geneaholics.